In 1992 bassist Joris Teepe left his homeland - The Netherlands - to chase his dream of being a jazz musician in New York. He moved into a $300-per-month room in Manhattan. The room was so small that in the daytime the double bass occupied his bed, so he would store it in the shower at night. In the year 2000 Joris met with the legendary free jazz drummer Rashied Ali, and this triggered a major change in his vision on life and music. Ali is well known for his ground-breaking work with John Coltrane (their duo album ‘Interstellar Space’ is considered a classic). 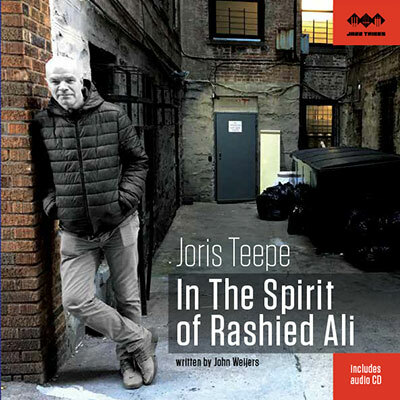 “For me, Rashied Ali has been hugely important to my musical development", says Joris. 'In The Spirit Of Rashied Ali' is his homage to his teacher and friend. Tracks on the album include an extensive Suite of 5 compositions by Rashied Ali, and compositions by Thelonious Monk, Frank Lowe (member of the Rashied Ali Quintet), Don Cherry, Ornette Coleman and Joris Teepe. The record comes with a bunch of vivid memories, that are bundled in a 60 pages hard cover book, plus audio cd. The official release party was on September 12, 2018 at Smalls Jazz Club in NYC.